Emergency departments in hospitals around the world are under pressure to reduce waiting times. This column analyses the effect of a government target for hospitals in England which mandates a maximum waiting time of four hours. The target successfully reduced waiting times and mortality, but increased costs per patient. The emergency department (ED) is a key part of healthcare systems in all countries. Patients arrive at the ED seeking treatment for a broad range of conditions, some of which are minor, some life-threatening. This is often their first contact with medical services. ED staff must quickly assess the severity of the condition, the correct course of treatment, and decide whether to admit patients to hospital or send them home. Pressure on EDs in many countries have grown in recent years, leading to discussion of an international crisis in emergency medicine (Hoot and Aronsky 2008). Patients are increasingly pressuring hospitals to cut waiting times. US hospitals compete on these wait times, advertising them relative to their competitors on digital billboards in city centres. In less market-based systems, regulators have introduced penalties and policies to penalise hospitals that force patients to endure long waits. In recent work (Gruber et al. 2018), we study how a policy to limit ED waiting times to four hours in England affected the care received by patients, and their ultimate health outcomes. Introduced in 2004, the policy stated that 98% of patients who arrive at English public EDs must be admitted for further inpatient treatment, discharged, or transferred to another hospital within four hours. The target was reduced to 95% in November 2010. A similar target has been adopted in Australia and New Zealand. The policy has attracted media attention, typically as a bellwether for the overall performance of hospitals in the National Health Service (NHS). In recent years performance against this target has dipped, and a widely held view is that this reflects a decline in quality of care. But this misses a more fundamental question: what does the target mean for patients? While the target introduces an incentive to treat patients more quickly, it is likely that the behaviour of providers may change in other ways if doctors and nurses need to diagnose and treat patients in less time. Figure 1 shows the distribution of ED waiting times in 2011-12 and 2012-13 across all major English hospitals. This shows an obvious spike in wait times just less than four hours: more than 10% of patients left the ED in the 10 minutes before reaching the four-hour target. Unfortunately, there are no pre-target data and the policy was implemented nationally, so there is no obvious control group with which to compare the impact of the policy on waiting times. Instead, we use bunching techniques that have been commonly employed in other research (Saez 2010, Chetty et al. 2013, Kleven 2016) to examine the impact on waiting times. 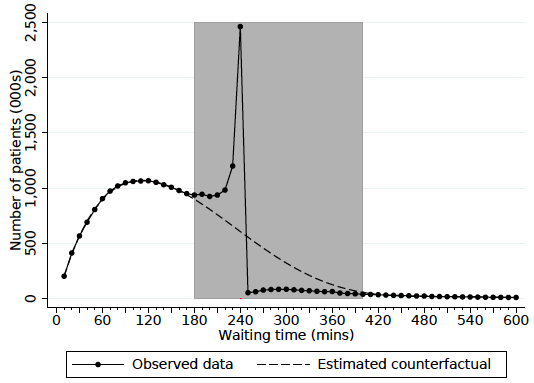 When we do this (as shown by the dotted line in Figure 1), we find that the policy reduces waiting times by 19 minutes, or 8% of the counterfactual mean wait. Source: Gruber et al. (2018). So the policy appears to be successful in reducing waiting times. But what else does it mean for patients? 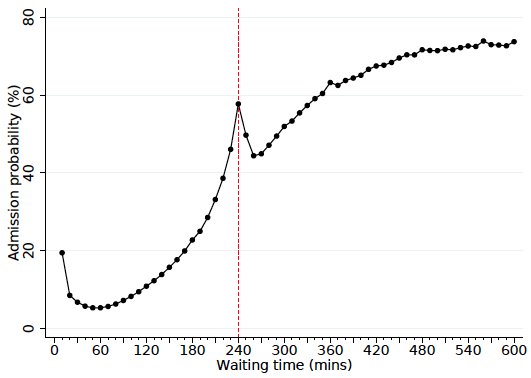 Figure 2 plots the probability of inpatient admission (for further treatment) by 10-minute wait-time categories. Again, there is a clear and obvious spike in outcomes just prior to four hours. Patients who exit the ED in the few minutes before the target time have a higher probability of admission than those who leave just after it. A composition effect might arise when patients, who in the absence of the target would have waited more than four hours, are now treated within four hours. Patients who wait longer are, on average, more likely to be admitted, and so moving these patients forwards will increase the admission probability of those who now get treated in the period immediately prior to the target. Second, a distortion effect could arise whereby, over and above the changes in the time in which patients are seen, a given patient is now more likely to be admitted as a direct result of the target. This could happen if doctors are pressured into making quicker decisions, and so admit patients who, in the absence of the target, they would observe for longer before ultimately discharging home. To identify these separate effects, we compute a composition-adjusted counterfactual. This considers the movement of patients from after the target to before the target (the composition effect) but does not include distortion from the policy itself (the distortion effect). Comparing the observed outcomes to the counterfactual outcomes allows us to identify the distortion to patient care decisions caused by the target. This exercise relies on an assumption that patients who obtain shorter waiting times are randomly drawn from the patients whose timing is not brought forward. This is a restrictive assumption, but it can be tested empirically by carrying out the same tests with demographic characteristics that should be subject to the composition effect, but not the distortion effect. In other words, hospitals can move forward older patients, increasing the average age of patients treated in just less than four hours, but they cannot make those patients older or younger. If patients are randomly selected, we can use the age of patients who remain after four hours to predict the changes in age for patients treated before. After adjusting for this composition, we find no selection effects on age and predicted mortality. This suggests that our assumption is plausible. Using this method, we estimate that the target reduces waiting times, and also increases treatment intensity for patients. It also increases costs over a 30-day period by around $130 per patient. We also find, however, that changes in treatment had beneficial health impacts for patients. We estimate that 30-day patient mortality fell by 14% as a result of the treatment. This effect fades slightly over time, but still accounts for a 3% reduction in mortality over a year. What causes these health improvements? We examine two potential mechanisms – shorter waiting times and more inpatient treatment – by studying variation in the impact of the target for two patient groups. First, across patients of different severity, we find that the effect on waiting times varies significantly but the impact on admission probability dioes not. Second, when inpatient wards are crowded, and there are fewer beds available for new admissions, we find that the target induces fewer admissions, but the waiting time effects are unchanged. When we compare the different magnitude of effects on mortality, waits and admission probabilities across these groups we find that larger mortality effects are associated with larger reductions in waiting times, but not with increased admissions. While these effects are not causal, the evidence strongly suggests that reduced waiting times, rather than increased treatment, are associated with reduction in mortality. Chetty, R, J N Friedman, T Olsen, and L Pistaferri (2013), "Adjustment Costs, Firm Responses, and Micro vs. Macro Labor Supply Elasticities: Evidence from Danish Tax Records", Quarterly Journal of Economics 126(2): 749-804. Gruber, J, T P Hoe, and G Stoye (2018), "Saving Lives by Tying Hands: The Unexpected Effects of Constraining Health Care Providers", NBER Working Paper 24445. Hoot, N R and D Aronsky (2008), "Systematic Review of Emergency Department Crowding: Causes, Effects and Solutions", Annals of Emergency Medicine 52(2): 126-137. Kleven, H J (2016), "Bunching", Annual Review of Economics (8): 435-464. Saez, E (2010), "Do Taxpayers Bunch at Kink Points? ", American Economic Journal: Economic Policy2(3): 180-212.